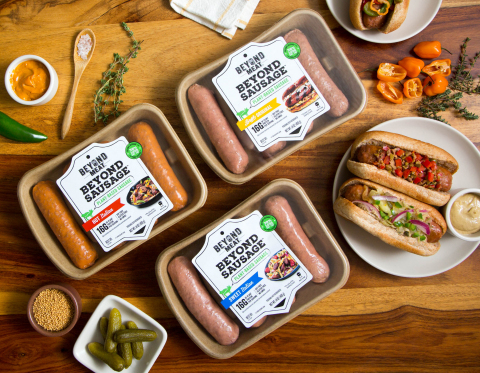 EL SEGUNDO, Calif.--(BUSINESS WIRE)--Beyond Meat® announces that this week Beyond Sausage™, the breakthrough plant-based links that look, sizzle and satisfy like pork sausage, will be arriving at Whole Foods Market® stores nationwide. 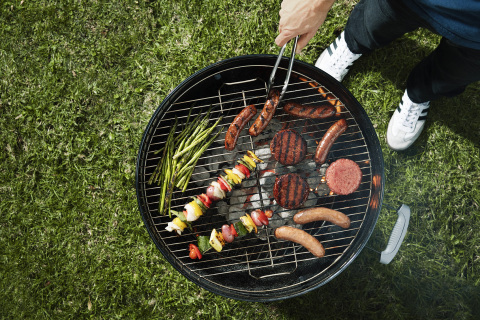 Just as the weather starts warming up and consumers look for new options for the grill, the missing links will be sold next to The Beyond Burger® at Whole Foods Market® stores across the country. Available in three mouthwatering flavors, Original Bratwurst, Hot Italian and Sweet Italian, Beyond Sausage will come in four-link packages. The latest innovation from plant-based leader Beyond Meat delivers on the juicy, satisfying taste and texture of pork sausage, but with 16 grams of plant-based protein, more than that of traditional pork sausage, and 38% less saturated fat1. Unlike pork sausage, it contains no nitrates or antibiotics, and has no GMOs, soy, or gluten to boot. Beyond Meat uses their cutting-edge process to organize each ingredient to deliver against the unique texture of pork sausage. By braiding together proteins, fats, minerals, and water, Beyond Meat is able to re-create the basic architecture, and thus texture, of meat. Peas, fava beans, and rice provide the protein, trace amounts of beet juice lend the meaty red color, coconut and sunflower oil ensure mouthwatering juiciness and a 100% plant-based casing derived from algae brings it all together. In addition to all Whole Foods Market stores in the U.S., Beyond Sausage will be available through Amazon Fresh as well as on the menu at Schaller’s Stube in New York City, Bareburger at Yankee Stadium (section 132), Rosamunde in San Francisco, The Moonlighter in Chicago, Wurstkuche in Los Angeles and Veggie Grill locations nationwide. Beyond Sausage’s similarity to pork sausage has already made it a popular choice for chefs and butchers alike. Since launching on the menu at NYC’s Schaller’s Stube, Beyond Sausage now accounts for 35% of the German sausage shop’s sales. Similarly, after trying Beyond Sausage for the first time, celebrity chef and restaurateur Spike Mendelsohn was inspired to use the Beyond Sausage to create his favorite Bratwurst preparation. A combination of sautéed sauerkraut, dill relish and a healthy dose of large grain mustard, step-by-step directions to create Spike’s Beyond Brat build at home can be found on the Beyond Meat website. For the latest Beyond Sausage updates, including additional retailer availability, be sure to sign up for the Beyond Meat newsletter. Beyond Sausage is the latest innovation in Beyond Meat’s portfolio of plant-based meats that include the breakout Beyond Burger, Beefy Crumbles and Chicken Strips. The Beyond Burger is the world's only burger that looks, cooks, and tastes like ground beef from cows but is made entirely from plants, without GMOs, soy, or gluten. Now available in more than 20,000 grocery stores and 7,000 restaurants nationwide, Beyond Meat’s revolutionary products are the go-to meat option for those looking for a delicious, satisfying meal, while being better for human health and the environment. Based in Los Angeles, California, Beyond Meat is a privately held company with a mission of building meat directly from plants. Investors include Bill Gates, actor and activist Leonardo DiCaprio, Twitter co-founders Biz Stone and Evan Williams, Kleiner Perkins, former McDonald's CEO Don Thompson, Honest Tea founder Seth Goldman, Humane Society of the United States, and Tyson Foods. To stay up to date on the latest, visit www.BeyondMeat.com and follow @BeyondMeat, #BeyondBurger, #BeyondSausage and #FutureOfProtein on Facebook, Instagram and Twitter.